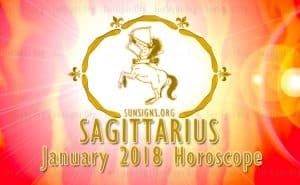 Sagittarius January 2018 Horoscope predicts great things in various fields and the month turns out to be fabulous. Planetary strength is located in the southern half of the horoscope. Hence family and emotional aspects of life rule over profession and outer ambitions as the House of Family is powerful. You will be active with the happenings in the family and you will enjoy the activities of family members. Professional concerns can be left behind and you can use this period to visualise your future and plan your strategies. Sagittarius personality will get an opportunity to execute them in days to come. Most of the planets are in the eastern half of the chart in January 2018. This is the time to use your independence and will power to accomplish what you want. You are not at all dependent on social grace and there is no need for adaptability or collaboration from others to accomplish their goals for Sagittarius zodiac sign. Your skills and your actions will decide your destiny. The solar eclipse of the 4th will deeply impact your beliefs and you may go in for a thorough overhaul of your spiritual ideas and systems. This will improve your spiritual quotient and you will become a better person. Students will have to withstand major modifications in their academic career. Career Horoscope foretells that professional concerns are in the visualisation stage for Sagittarius born people. With the retrograde of planmets during the month end, you have to exercise due caution. The monthly astrology forecasts for January 2018 for Finance indicate that monetary situation will be fantastic throughout the month. However you have to work hard and overcome serious obstacles to achieve your financial goals. The solar eclipse of the 4th will force radical changes in your financial strategies. Your financial decisions may not be always right and you have to put in more effort to correct your mistakes. Love Horoscope 2018 predicts that family atmosphere will be harmonious and your relationship with your beloved and family members will be excellent. Singles will have many romantic possibilities and they have to just choose. However they seem to be interested in having more fun by dating with their lovers without commitment due to the influence of Jupiter. Good aspects of Jupiter will be evident in the personal activities this month. You will be interested in creative pursuits, and simultaneously you are looking for enjoyment in life. The emphasis will be on emotional happiness and not on materialistic entities. Health Astrology points to very good health without any major hiccups. Stick to your normal fitness regimen to stay fit. The January 2018 horoscope for Sagittarius is promising great things in the fields of finance, family relationships and physical well being. Career prospects are not important during the month. You may see Rashifal 2018.